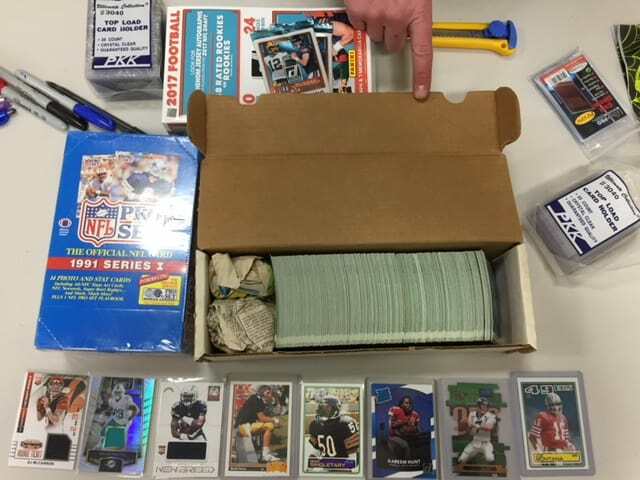 On February 24th, 2018, Lower Level Sports Cards & Collectibles ran it’s first Pack War series at the “After Party” following the sports card show at Chalmers community club. 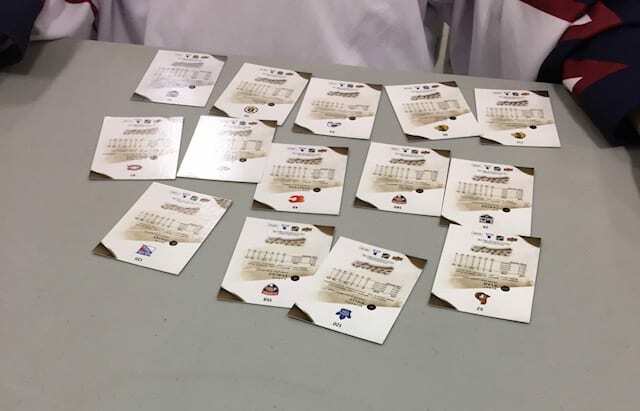 Not to be confused with the Hireling card game of the same name, and loosely based on other sports card stores who do their own version of Pack Wars, this round of Pack Wars required a small fee to buy-in for each round. And since we’ve decided to change the pack-opening game – and made it better, in our humble opinion – we’ve dubbed it Pack Wars 2.0. Your buy-in fee bought you several packs of cards for each round and we played four rounds total. One round with baseball cards. One round with football cards. This was the most challenging round for those of us new to looking at football cards. And two rounds with hockey cards. These were the rounds my kids and I enjoyed the most. Best of all, you got to keep all the cards in the packs you opened and you were eligible to win 1 of 40 prizes. Each round had 10 prizes. In order to give you an idea of how this particular version of Pack Wars was played, I’ll give you three questions as examples. 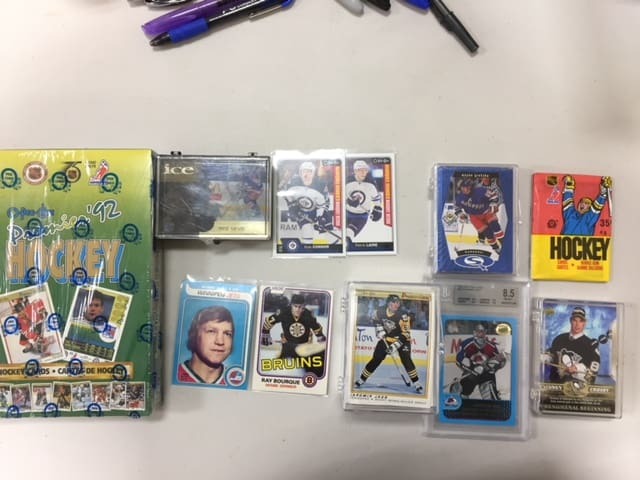 $10 got you 4 packs of hockey cards with 8 cards in each pack. 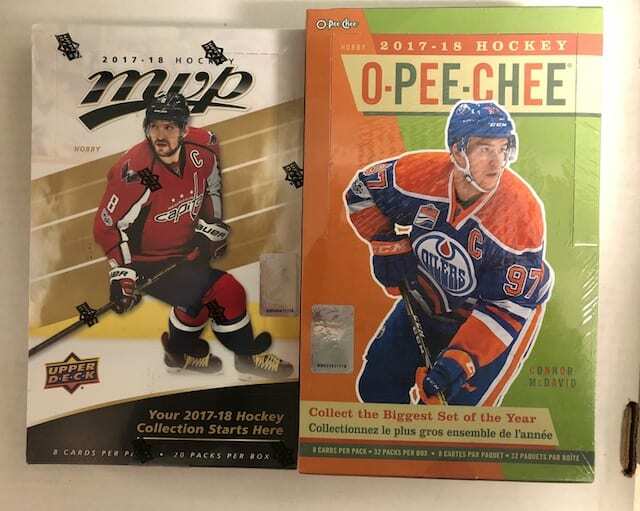 If you consider that most packs of hockey cards today start at $2.50, you’ll immediately see that you’re not wasting your money. After we bought our cards, we sat down and opened them up, hoping that we’d hit upon a *good* card. 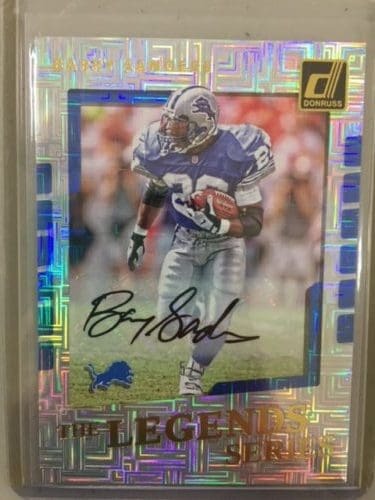 My daughter got this autographed Barry Sanders card in one of her football packs. It’s one in five…so quite valuable. Once everyone had familiarized themselves with their packs and sorted them to their liking – or spread them all in front of them – the organizer of the event asked us one question at a time. Plus minus? I had never heard of plus minus but I figured it out. What I mean is that I figured out where the plus minus column was. From there, I realized that I was looking for lowest negative number. 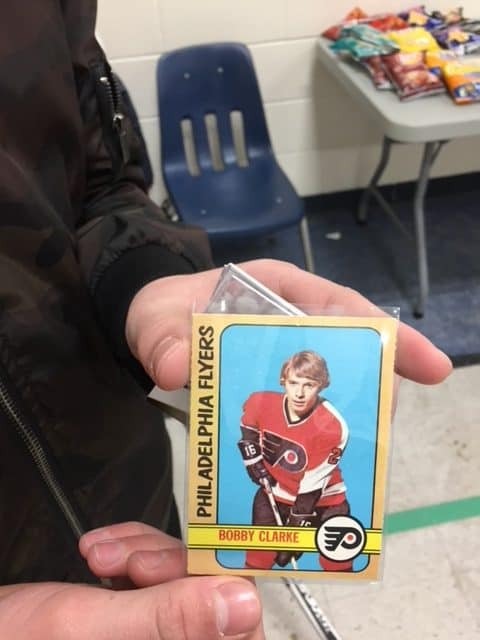 While veteran card collectors called out their worst plus minus number, my 9-year-old son and I slapped our way through our stack of cards, scouring the backs of them for the correct line of information. Justin William had a 121 +/-. Too good for us. Lee Stempniak had -22. That’s getting closer to what we wanted. Matt Duchene had -61. Oops. But that’s what we were looking for! Jaromir Jagr has a 316 +/- over 23 seasons! And we learned that goalies don’t have a +/-. Makes sense. When we didn’t understand the question (football!) we often didn’t make it through all of our cards in order to find the answer we needed before the next question was asked. But with hockey, we did pretty good. And we learned what a plus minus rating means. This time, my son and I flipped over our cards to look at the front. We had quite a few! And we learned that there are many NFL teams that have animals in their names. 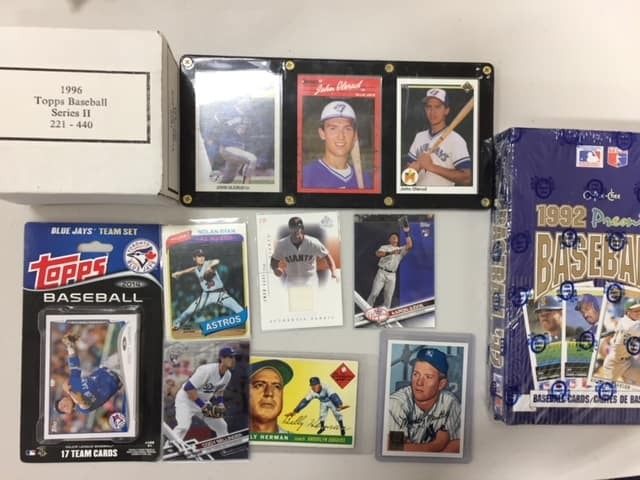 I’ll give you one last example, this time with a question we got after opening our baseball cards. This was one of those questions that took a bit of searching, but once you found the answer, it was easy for me to find the statistic on the back of each card. For my 9-year-old though, it was a little more challenging. But we made it through all of our cards, the two of us working together side by side. We won a couple of prizes. Well, HE did. 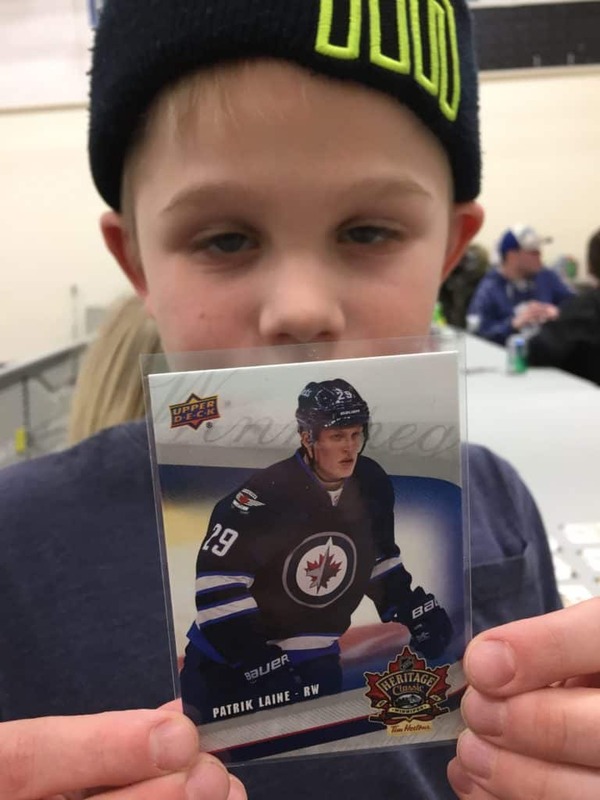 I let him keep the few prizes he won, including this Patrik Laine card. interactive; my son and I worked together as a team, people called out their answers and tried to find numbers and stats to win…it was a great group activity! beyond basic reading and number recognition skills, including 3 digit and negative numbers, it also required some deciphering. My brain hurt after the football round. And before you make fun of me, most of the questions were more challenging than animal team names. it also required some memory work since you would often have to remember the lowest or highest number. Of course, I had a way to work around my poor memory, and hopefully my son learned something from me in the process. dexterity, as you shuffled through the pack repeatedly. I found it easy to flip through the cards. My son was much slower than I was. I guess I should probably add patience to this list, since I could have used a little myself and let my kid do more of the work without me. You could say I’m a little competitive. This past weekend, my family & I played Pack Wars 2.0 again. And just like the first time, my 5 kids hung out together. Are you ready to play Pack Wars 2.0? Pack Wars 2.0 is a fun group/family game! Go visit your nearest Sports Card store, buy a box of cards with enough packs for your entire group. Get 20 “Pack Wars 2.0 for Hockey” questions…for free! Just sign up and subscribe to the Winnipeg Sports Cards email newsletter HERE. Every Friday, your free downloadable game will arrive in your inbox. Be sure to WHITELIST: manitobasportscards@gmail.com. You can now purchase 5 different versions of the Pack Wars 2.0 game. Just email manitobasportscards@gmail.com and let us know which game you want. See available games here.